While sitting at dinner last Friday, my darling Cassandra asked if she could pick the cookie of the week. As I had no internet and thus could not peruse the web for suggestions, I assented. And then she said, “French macarons”. 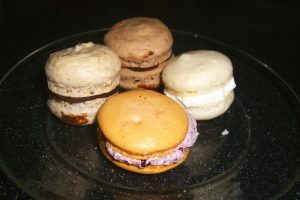 Now, the last time that I attempted French macarons was back in 2005 – and let me just say, it was a disaster. If you do not know what a French macaron is, here goes: imagine an Oreo. Now replace the cookies with meringue. Now replace the filling with ganache/buttercream. There you go. They’re pretty much ubiquitous in Paris. So the problem that we are faced with is: we must make lots of equally sized meringues and make sure that when they are baked, they are absolutely dry so that they slide off of the baking sheets and can be properly iced. This time, I experimented and finally found a method that worked (I could have taken a better picture, though). We managed to make 4 flavours: vanilla, mocha, chocolate and cherry. 1. Line 2 baking sheets with parchment paper (again, IMPORTANT). Sift together the confectioners sugar into a medium bowl and whisk in the almondd flour. 2. In a large bowl, combine the egg whites and cream of tartar. Beat on medium speed until the whites begin to thicken, then increase the speed to medium-high and beat just until soft peaks form. Slowly add the superfine sugar and beat until stiff peaks begin to form. Beat in the vanilla until well-blended, then fold in the flour mixture. 4. Preheat the oven to 300oF and bake the cookies 1 sheet at a time for 20-25 minutes, rotating halfway through, until the tops and bottoms are firm and golden. 5. Remove from the oven and let cool on the sheets for 3 minutes. Then peel the cookies off of the parchment paper and transfer to wire racks to cool completely. For cherry, add 2 drops of red food colouring with the vanilla. For chocolate, sift 3 tbs of unsweetened cocoa powder with the confectioners’ sugar. For mocha, add 2 tbs instant coffee with the vanilla, and sift 3 tbs of unsweetened cocoa powder with the confectioners’ sugar. 1. Place the butter and chocolate in a heat-proof bowl. In a small saucepan over medium-high heat, bring the cream to a boil. Remove from the heat and pour over the chocolate and butter. 2. Stir with a whisk until the chocolate and butter melt and are smooth. Let cool until spreadable. Variation: For mocha, add 2 tbs instant coffee powder. 1. Mix together the sugar and egg whites. Place in a double boiler and continue to mix until the mixture is quite warm and the sugar has dissolved. Remove from heat. 2. Beat the mixture on high speed until it is stiff and glossy (this will take awhile). 3. Add 2 c (1 lb) of butter and continue to beat on high speed until the frosting begins to pull away from the sides of the bowl, adding more butter as needed. The mixture should be smooth and satiny. If it looks curdled and the bowl feels old, warm slightly over hot water. Variations: Whip in some flavour of jam (e.g. cherry) or food colouring.